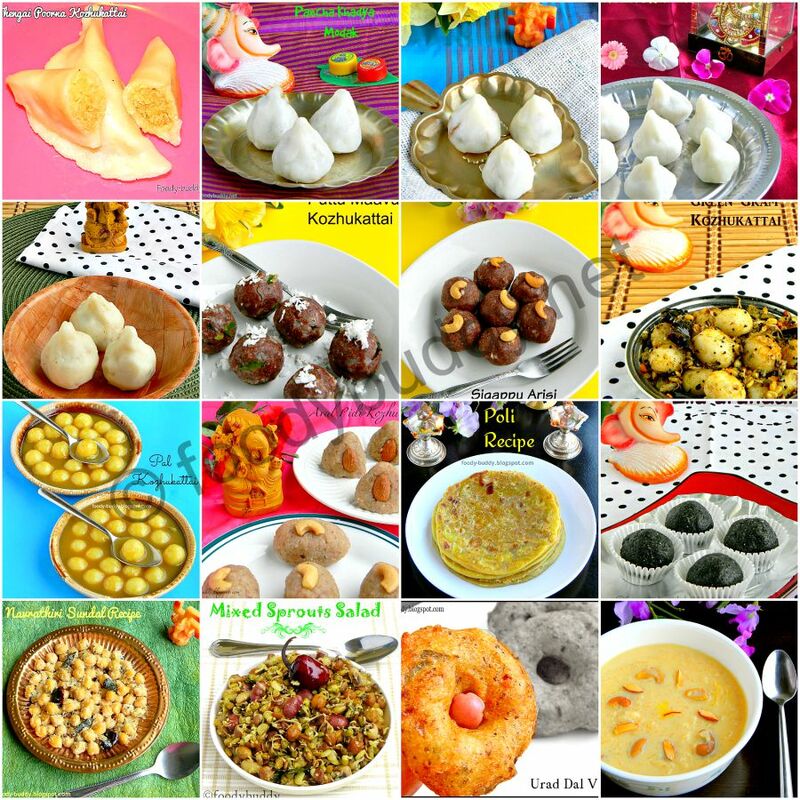 Here you can find the collection of ganesh chaturthi recipes – ellu kozhukattai, poorna kozhukattai recipe, pidi kozhukattai recipe, kara kozhukattai, aval kozhukattai, kondakadalai sundal recipe, medhu vada recipe, payasam recipes and appam recipes. Try sweet and kara kozhukattai recipes and other special recipes for ganesh chaturthi and have a great celebration. Tags: vinayagar chaturthi recipes 2015, ganesh chaturthi recipes, pillaiyar chaturthi recipes, kozhukattai recipes 2015, modak recipes, how to make soft kozhukattai, how to make modak recipes, payasam recipes, urad dal vadai, sundal recipes, nei appam, ellu urundai, ladoo recipes, poli recipes. Pancha Khadya Modak Recipe / khirapat modak is a famous sweet modak(dumpling) from Maharashtra (India). Panchakhadya is a special neivedyam that is offered to Lord Ganesha on Ganesh Chaturti. Khirapat contains 5 main ingredients starting with kha in Marathi letter – Khobra(coconut), Kharik(dates), khaskhas(poppy seeds), khismis(raisins), khadisakhar(rock sugar). Mixture of these 5 ingredients combined together gives you this scrumptious modak. Try this pancha khadya modak for Ganesh Chaturti and let me know how you liked it. 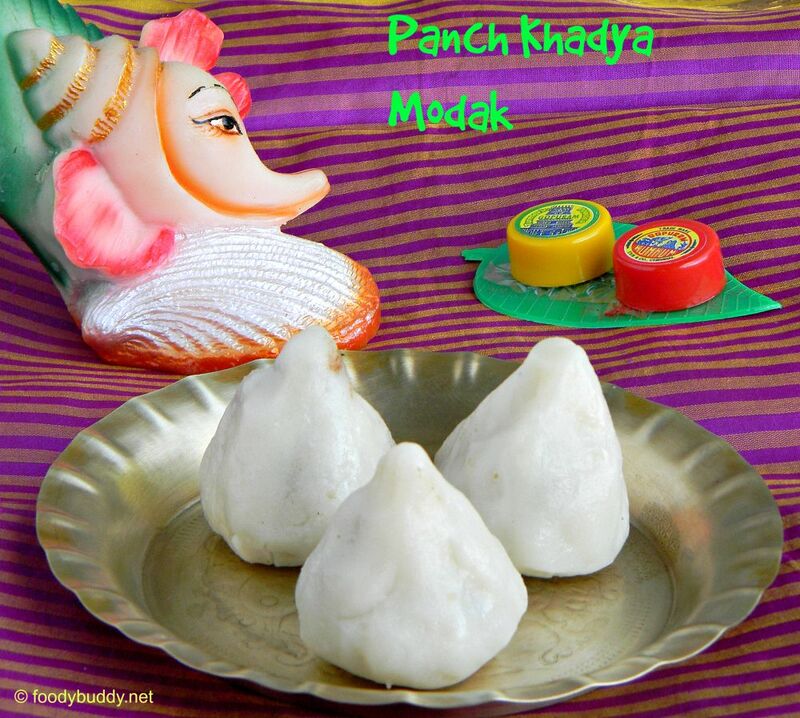 Pancha Khadya Modak Recipe / khirapat modak is a famous sweet modak from Maharashtra. Panchakhadya is a special neivedyam that’s offered to Lord Ganesha on Ganesh Chaturti. Dry roast the coconut until colour changes and keep it aside. Dry roast the poppy seeds in a medium flame for few mins and keep it aside. Remove seeds from dates, soak it in hot water for few mins and grind them coarsely. In a mixie, powder the sugar and keep it aside. Finally in mixie, add all the ingredients and grind it together. Khirapat filling is ready. For the outer covering dough, bring the water to boil along with ghee. In a bowl, add rice flour and salt, add water slowly and keep mixing with spatula. Let it cool it for 2 mins, it will be warm by now, start kneading to form a smooth dough. Keep covered to prevent from drying. Make a equally sized balls out of the dough. Grease your hand with oil, take a ball and flatten it with your hand. Add a tsp of filling in the centre. Fold it and seal it in the centre. Repeat the same process for the rest of the dough. Steam the modak in a idly pan or steamer for 10 mins. Pancha Khadya Modak Recipe / khirapat modak is ready for neivedhyam. If you don’t have rock candy, replace it with regular sugar. If you want, you can also add a pinch of cardamom powder or nutmeg powder. 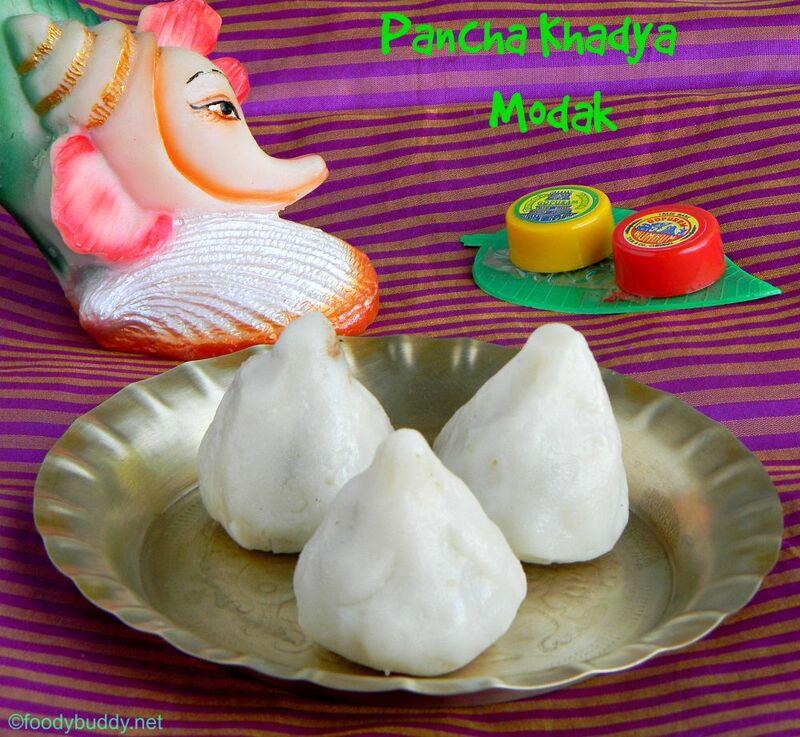 Tags: Pancha Khadya Modak , Panch Khadya Modak Recipe, khirapat modak, how to make khirapat modak at home, how to make Panch Khadya Modak Recipe at home, khirapat, easy modak recipe, maharstrain style modak ganesh chaturthi recipes 2015, vinayagar chaturthi recipes 2015.